My first thought? That is an odd band name. Idora. It doesn't exactly scream hard rock or heavy metal. But there is some significance to the name. Principal members Brian Colkitt (vocals) and Mike Floros (guitars, vocals) grew up in the Idora neighborhood of Youngstown, Ohio. Years later, the men, living now in Phoenix and Los Angeles respectively, have come together to revisit their melodic hard rock roots, form Idora, and cut a full length album, Wildcat. It's hardly an understatement, but Idora wears those melodic hard rock roots on their collective sleeves. 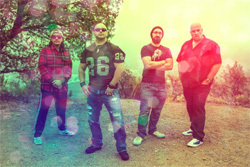 Drawing from influences like KISS, Stryper, Winger, Dokken, and Quiet Riot, among others, the band are Eighties refugees, making an album of "throwback Thursday" tunes. And they're pretty darn good at it. Idora gets the essentials right. The right combination of harmony, melody, and groove through guitar and vocal harmony to steady rockin' rhythm section. Colkitt sings clean, with strength and assertiveness (which sometimes gets him going a tad screamo). Floros' guitar riffs are a impressive combination of sharpness, harmony, and briskness. His leads soar, scream, and roar in a classic rock style and less neo-classical widdling. The songwriting, the arrangements, are coherent and well-crafted offering hooks from melodic lines to catchy refrains. Mostly, a DIY project by the band, the production is crisp and clean. This may be a vocal and guitar forward album, but the mix brings out the clarity of the bass line. To the songs themselves, I can honestly say, while liking some more than others, they're all solid and entertaining. My top picks: Go For The Throat, Silver and Black, Superman, and the powerful Eighties sounding Saints and Sinners. The latter two songs also have fine vocal arrangements. Toss an honorable mention to the only ballad, Simple Man, where Idora tries to reach into their Southern rock groove. 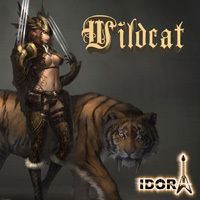 All in all, Idora's Wildcat lives up to it's pitch and promise, a satisfying platter of classic melodic hard rock in the memorable Eighties tradition. Recommended. All in all, Idora's Wildcat lives up to it's pitch and promise, a satisfying platter of classic melodic hard rock in the memorable Eighties tradition. Recommended.